A car driver has crashed into crowds watching a Dutch royal parade, killing five people, in an attempted attack on the royal family, officials say. 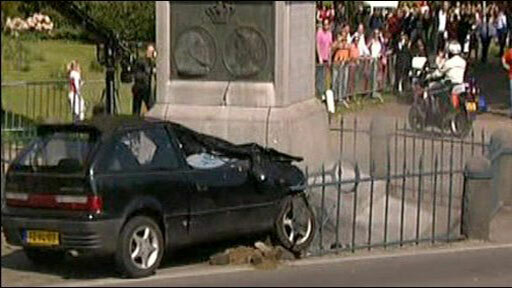 The car careered into a monument metres from an open-topped bus carrying Queen Beatrix and members of her family. Officials said the 38-year-old driver had suffered life-threatening injuries. Prosecutor Ludo Goossens said the man, who is a Dutch national, would be charged with attempting an attack on the royal family and murder - if he survives. "The man indicated that his action was aimed against the royal family," Mr Goossens told journalists in Apeldoorn. After searching the car and his home, investigators ruled out terrorism as a motive and said it appeared he had acted alone. 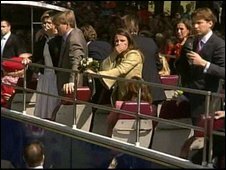 Members of the royal family were shown looking on in horror as the battered car rammed spectators before crashing into the stone monument. In a televised address, Queen Beatrix called the incident shocking, and said everyone would empathise with the victims and their families and friends. "What began as a great day has ended in a terrible tragedy that has shocked us all deeply," she said. "People who were standing close by, people who saw it happen on television, all those who lived through it, must have looked on with bewilderment and disbelief. "We're speechless that something so terrible could have happened." "There were people everywhere, you could definitely see that it was serious because everywhere was blood and shoes ripped off and all the people giving CPR," she said. Other witnesses described people being flung into the air as the car crashed through the throngs who had turned out to see the queen. Officials said two men and two women died at the scene of the incident, while another person died later in hospital. The crowds were celebrating Queen's Day - a national holiday in the Netherlands when thousands of people take to the streets to mark the queen's official birthday. Hundreds of police officers were on duty in a huge security operation that took months to plan. But the authorities said they were taken completely by surprise when the small black car smashed through a security fence and into the crowd of people. Following the incident, flags were lowered to half mast on government buildings across the country and all planned celebrations were called off. Witnesses said the streets of Apeldoorn were now deserted.